There two elements that are vital to all life; calcium and carbon. Both are equally important, so I want to look at both and see how they fit into our farming system. Calcium is important because calcium is both milk and bone. If farmers are to grow stock then calcium is an important ingredient to start off our young stock whether they be sheep, cattle or any other animal. Milk is an essential ingredient, but let’s go back to our health because that is why we have food. To begin with, we need calcium to maintain a healthy skeleton. As bones break down, calcium helps build new bone, which is why it’s so crucial to get enough calcium throughout your lifetime. It’s especially important in childhood when bones are still growing and in old age when bones break down faster than they can rebuild. But calcium is not just about strengthening your bones and teeth. Your body also needs calcium to contract all muscles in your body (including the heart), to transmit messages (nerve impulses) between the brain and virtually every other part of your body, to activate blood-clotting factors, to move blood through your veins and to secrete hormones. Calcium also helps stabilize and optimize proteins and enzymes in the body. In short, calcium is vital to almost every function in the human body! Now the same goes for the animals which we farm. Calcium is a vital part of their diet so it must be in their feed. Simply put, there are two areas of importance. The cow has, usually, some stored calcium reserves in bone and she can increase the amount of calcium she absorbs from the diet but these mechanisms must be “turned on”. Essentially this is the main role of magnesium at this time. Insufficient magnesium may mean failure of the “on” switch and hence hypocalcaemia. You must be supplementing adequate magnesium pre-calving. NB: too much magnesium can be as much a problem as too little and this is not the only role of magnesium in the cow. Vitamin D and PTH are part of this magnesium initiated switching mechanism. In some cows, there are defects and deficiencies in this system and in most cows, there is a delay between “on” and working at full speed which has implications for calving and appetite post calving. Jerseys tend to be more affected than Holstein Friesians because they have fewer receptors in the gut or less “calcium gateways”, consequently the incidence of hypocalcaemia is potentially greater in Jerseys. Autumn is the time to put into place a good Calcium and Magnesium programme. The second element is carbon. But it is not as well known or talked about. Recent interest in carbon sequestration has raised questions about how much organic carbon (OC) can be stored in soil. Total OC is the amount of carbon in the materials related to living organisms or derived from them. In Australian soils, total OC is usually less than 8% of total soil weight (Spain et al., 1983) and under rain fed farming it is typically 0.7 – 4%. Increasing the amount of OC stored in soil may be one option for decreasing the atmospheric concentration of carbon dioxide, a greenhouse gas. 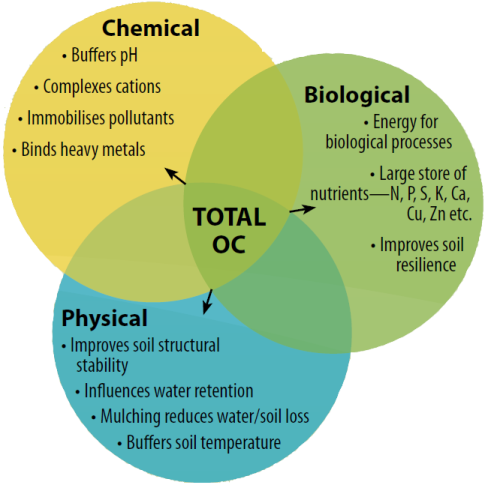 Increasing the amount of OC stored in soil may also improve soil quality, as OC contributes to many beneficial physical, chemical and biological processes in the soil ecosystem (figure 1). When OC in soil is below 1%, soil health may be constrained and yield potential (based on rainfall) may not be achieved (Kay and Angers, 1999). Figure 1: Organic carbon relationships in soil ecosystem. Carbon moves from the atmosphere to plants. In the atmosphere, carbon is attached to oxygen in a gas called carbon dioxide (CO2). With the help of the Sun, through the process of photosynthesis, carbon dioxide is pulled from the air to make plant food from carbon. Carbon moves from plants to animals. Through food chains, the carbon that is in plants moves to the animals that eat them. Animals that eat other animals get the carbon from their food too. Carbon moves from plants and animals to the ground. When plants and animals die, their bodies, wood and leaves decay bringing the carbon into the ground. Some become buried miles underground and will become fossil fuels in millions and millions of years. Carbon moves from living things to the atmosphere. Each time you exhale, you are releasing carbon dioxide gas (CO2) into the atmosphere. Animals and plants get rid of carbon dioxide gas through a process called respiration. Carbon moves from fossil fuels to the atmosphere when fuels are burned. When humans burn fossil fuels to power factories, power plants, cars and trucks, most of the carbon quickly enters the atmosphere as carbon dioxide gas. Each year, five and a half billion tons of carbon is released by burning fossil fuels. That’s the weight of 100 million adult African elephants! Of the huge amount of carbon that is released from fuels, 3.3 billion tons enters the atmosphere and most of the rest becomes dissolved in seawater. Carbon moves from the atmosphere to the oceans. The oceans, and other bodies of water, soak up some carbon from the atmosphere. 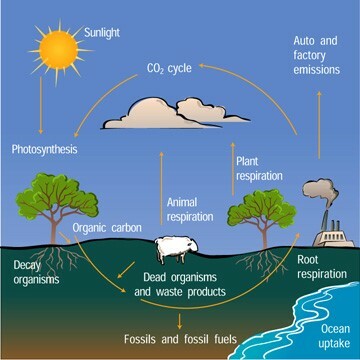 Figure 2: The Carbon Dioxide Cycle. From this information, it is clear that a good calcium/magnesium programme is essential, and if it was possible then a process of increasing carbon in the soil would also be beneficial. Well, we have some good news for you. Vitalife Magnesium will work towards this goal. It has a good Calcium to Magnesium Ratio and it also will work toward lifting the carbon levels in the soil. Vitalife Magnesium is a product that includes calcium, magnesium, organic matter and beneficial fungi and microbes. These improve plant growth by helping to control pathogenic fungi and disease. Vitalife restores the soil while at the same time protects from harmful elements. Fungi: our beneficial fungi controls pathogens by directly attaching parasites that compete for nutrients and space. Microbes: we add a tested range of working bacteria-based plant growth enhancers that are proven to control plant pathogens. Targeted bacteria: we also add selected strains of bacteria to control grass grub, porina and other pasture and crop predators and pests. Magnesium: is a powerful soil conditioner but we also add organic matter to enhance the natural organic cycle even more. Calcium: is the most important soil nutrient. It governs the uptake of other nutrients, including oxygen needed for good soil health. Phosphate is one major element that is missing in New Zealand soils and because of that New Zealand quickly saw the need to import this component. The Superphosphate story starts in 1842 when the process of treating mineral phosphates with sulfuric acid to make superphosphate was patented. By 1843 sales of phosphate were being made in England. The first agricultural settlers from England into New Zealand would have known of this latest innovation and realising that the phosphate levels in our soils were low New Zealand farmers decided to import super. This quickly turned into a bigger operation which lead to a manufacturing plant being established prior to 1900. The benefits of superphosphate are that it is 100% available and is largely water soluble. The down side of this is plants don’t need to have all the phosphate available on day one, they only need enough available to meet their daily requirement. If for whatever reason there is a weather event or extra water is applied, there is a possibility that it will become soluble and leave the intended placement area. The net result is the farmer loses the benefit of the applied phosphate. This is both a waste of money and a problem in the environment. What are the options for the farmer? What is needed is a phosphate that has some available and some in reserve, a timed-release phosphate which isn’t water soluble. One that will stay in place in a rain event, and still delivers the required phosphate. There are deposits of natural phosphate rock which will deliver phosphate to the plant. This type of phosphate doesn’t need to be treated nor does it need to go through a chemical process. It is totally natural. Research both in New Zealand and overseas shows that it is possible to grow the same amount of crop, pasture or any other produce using this natural phosphate. In New Zealand one of these trials was conducted by some of our best scientists. According to those who were there, not all their findings were reported. Apparently, they were too good to be true. In my opinion all the data needed to be reported. It was paid for with public money and the public should be able to make up their own mind about the findings. There is some talk in farming circles that New Zealand does not have any Reactive Phosphate Rock or RPR for short. While I respect the opinion of these people and organisations, they may have overlooked the fact that we do have high quality RPR available. It has been Fertilizer New Zealand’s policy to follow the guide lines set down by our Trading Partners, one in particular is the cadmium levels. The present levels of permissible cadmium in phosphate in the EU is 60 ppm, they will be required to lower this to 20ppm soon. Our current levels of cadmium in our range of phosphates are between 6ppm to 20ppm. As farmers we should be concerned with the levels of cadmium in our phosphate and there is a need to check with the supplier regarding the levels of cadmium in the phosphate they are applying. To find out more about this type of environmentally friendly phosphate talk to us.